» How Did Roger Clemens Walk? For more than four years, the federal government put together a case to prove that Roger Clemens had made false statements to a House Government Reform Committee that was investigating performance-enhancing drug use in baseball. On Monday, after only two full days of deliberation, a jury found Clemens not guilty on all counts. The trial featured 46 witnesses and was marked by “agonizingly tedious hours of testimony” that put multiple jurors to sleep. In case you also slept through the trial, here’s the short version of what happened — the government pinned its hopes on a shaky witness and a crumpled beer can, and lost. For those of you who want a more thorough recap, I’ll try to catch you up now. In December 2007, former Senator George Mitchell released the Mitchell Report, which concluded that steroid and HGH use was pervasive in Major League Baseball. The report also concluded that former trainer Brian McNamee had injected Roger Clemens with steroids and human growth hormone numerous times in 1998, 2000, and 2001. Rusty Hardin, Clemens’s lawyer, publicly challenged its accuracy. Clemens then requested a hearing before Congress to respond to the allegations in the Mitchell Report. At that 2008 hearing in front of the House Committee on Oversight and Government Reform (and in a deposition Clemens gave before the hearing), Clemens vehemently denied that he took performance-enhancing drugs. The first trial, which began in July 2011, ended abruptly with a mistrial. The second trial began in April and came to a merciful close this week. This case boiled down to a long, expensive, and utterly boring game of “he said, he said” between McNamee and Clemens. McNamee said that he injected Clemens with HGH multiple times in 1998, 2000, and 2001, and that he saved a needle and other waste from a 2001 steroid injection of Clemens and stored it in his house in a Miller Lite can inside a box for more than six years. Clemens’s lawyers claimed that the evidence was, literally, “garbage” (that McNamee had manufactured after the fact) and that McNamee had only injected Clemens with B12, not HGH. The bottom line: If the jury believed McNamee, Clemens was going to be convicted. If the jury believed Clemens, Clemens was going to be found not guilty. Was this a complete victory for Clemens? Yes, Clemens was found not guilty on all counts, so this was a perfect game, if perfect games involve sitting through a trial for two months while 12 people decide your fate, spending hundreds of thousands of dollars on legal fees, and having intimate details of your life dissected by the media. But let’s be clear. This doesn’t mean that Roger Clemens is “innocent.” It doesn’t mean that he never used performance-enhancing drugs. It only means that the government failed to prove, beyond a reasonable doubt, that Roger Clemens lied about not using HGH. How did the defense win? Put simply, the defense won because the jury believed Roger Clemens more than they believed Brian McNamee. Without question, this trial turned out to be as much (if not more) about McNamee as about Clemens. After their investigation, the government surely knew they had a witness who would single-handedly win or lose them the case, if simply because they had no one else and no other evidence that would come close to proving that Roger Clemens lied about using HGH. The problem for the government, of course, was that McNamee was a complete wild card. He was either going to be the government’s savior or its downfall. McNamee spent nearly 26 hours on the stand over the course of six days. The government tried to paint him as a sympathetic figure, having him reveal that he is a diabetic who uses an insulin pump, particularly when under stress. At one point, McNamee apologized to the jury for needing to take extra breaks during his testimony and explained that he lost his job, his clients, and his marriage as a result of the Clemens saga. He testified that Clemens asked for a “booty shot” back in 1998, and that McNamee injected him with performance-enhancing drugs eight to 10 times over the course of 1998, 2000, and 2001. He claimed that he saved a needle, cotton balls, and other materials from an HGH injection of Clemens in 2001 and stored them in a crumpled Miller Lite can inside a FedEx box before turning them over to federal authorities in 2008. McNamee explained that he held on to the materials at the suggestion of his now-estranged wife, who feared that he would take the fall for Clemens if his drug use was eventually discovered. 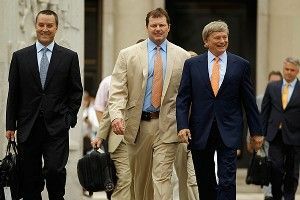 McNamee also testified — over the objection of the defense — that he provided HGH to Andy Pettitte, Chuck Knoblauch, and Mike Stanton. McNamee even claimed that he taught Clemens’s wife how to inject herself with HGH in her bedroom in 2003 — with Clemens in the room — and felt “creepy” for doing it. It was damning evidence. The problem for the government was that the jury didn’t believe it. Pettitte, the former teammate and close friend of Clemens, was — at least in theory — the prosecution’s next strongest witness. He testified that Clemens had confided in him in 1999 or 2000 that he had taken HGH. Pettitte had difficulty remembering the specifics of the conversations he had with Clemens in 1999 or 2000, and admitted on cross-examination that it was “50-50” that he might have misunderstood (or “misremembered”) his conversation with Clemens. One important victory for the defense was convincing Judge Walton to bar Pettitte’s testimony that McNamee had injected him with HGH in 2002. What about the DNA evidence? McNamee stored the DNA evidence in a Miller Lite can. And, as Bruce Goldberger, the defense’s forensic toxicologist testified, storing DNA evidence in a beer can is not the best way to maintain the integrity of the evidence (good thing they had an expert for that point). Worse yet, McNamee conceded that he stored DNA of other players in the same can (He hates these cans! Stay away from the cans!). Goldberger testified that this DNA evidence thus could have been contaminated. The government’s DNA evidence was weakened even further by DNA expert Mark Taylor, who testified that DNA from Roger Clemens found on a syringe needle could have been placed there intentionally by McNamee, and could have been the byproduct of dabbing at a blister, as opposed to an injection of HGH. Was this a complete failure? The government spent more than $120 million and countless hours pursuing Clemens. They examined 15,732 pages of Clemens’s family bank records from JPMorgan Chase, 1,139 pages of records from American Express credit cards, more than 300 pages of medical records from MLB teams for which Clemens played, and hundreds of pages of phone records. Ninety-three agents also interviewed 179 people in 68 different locations and produced 235 reports of their interviews. They called 24 witnesses. And yet all they had to show for it was a flawed “star” witness (who was obviously known to them before the investigation started), a mistrial, and not-guilty verdicts on all counts. Other than that, the government’s pursuit of Roger Clemens was a smashing success.